White balls in the garden? 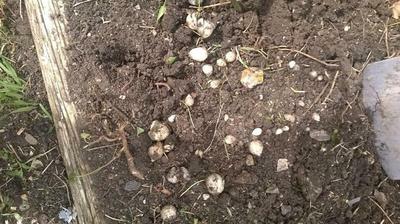 I keep digging these white balls up from my garden. They are quite hard but "pop" when you squeeze them.... what are they please??? Comments for White balls in the garden? At first I thought those little white balls were slow release fertilizer or those plastic moisture retention balls, but the photo shows different sizes. Don't know now! I'd still guess they are probably fertilizer balls like osmocote, and maybe they are all in different stages of disintergrating (disolving?). If they were fungi puff balls, or snail, slug or other pest eggs they would be decidedly squishy when squeezed and might even show the beginings of baby snails, bugs etc. If puff balls you would get a cloud of dry spores when squeezed. I'm still a bit curious, any other takers? I just found dozens of them in my garden too. I've done a few dozen searches but can't find any explanation. Anyone? I had something similar in my yard in Colorado. Mine turned out to be mushrooms. Strange but true. I was pulling weeds in my garden today and found some of those exact looking white balls. They were springy to the touch and somewhat solid but a couple were looser and one or two broke open. The ones that broke open oozed what looked like slime. Any ideas what this could be? I found similar ones but pink in my garden. They might be slime/mold called dog vomit from google search. found at the Minnesota Garden Extension: The objects in the photo are probably the immature fruiting bodies of a kind of fungus called a stinkhorn. The fungi live off dead organic matter and are commonly found in mulched areas in the landscape. Stinkhorns start off as an egg-like, golf ball-sized structure in the soil. As the fungus develops, a stalk grows upward and is topped with a slimy cap coated with a mass of olive green to brown spores. The putrid smell of the stinkhorn cap attracts flies and other insects. They are Stink Horn Fungi Eggs. Ever see the fungi that looks like an orange stalk growing from the ground? That is what you will eventually get. The come most times from moisture, hard rains, or snow packs. And especially after flooding.